Prijavljam se na DiaMind novičnik. Maja Rus Makovec, MD, PhD is psychiatrist at University Psychiatric Hospital Ljubljana, Associate professor at Medical faculty University Ljubljana and teacher and trainer at Systemic Family Psychtoherapy Institute Ljubljana. Her professional activity includes special interest into addiction, family and psychosomatic psychiatry. Julie Wagner is a health psychologist and Professor of Behavioral Sciences and Community Health, and Psychiatry, at the University of Connecticut. 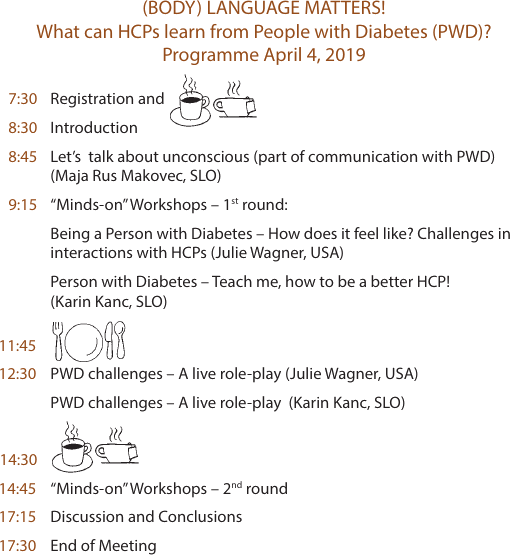 She teaches a bio-psycho-social-contextual approach to diabetes, and innovative curricula to promote cross-cultural communication between patients and healthcare providers. She researches psychosocial contributors to diabetes outcomes and designs and tests community-based interventions for the neediest populations with diabetes in the US and abroad. Her research is funded by the U.S. National Institutes of Health, the American Diabetes Association, and the American Heart Association. Dr. Wagner has served in editorial roles for leading health psychology journals, and has held leadership positions in professional societies including the American Diabetes Association, the American Psychological Association, and Behavioral Research in Diabetes Group Exchange (BRIDGE). Karin Kanc is one of the organizers of this meeting. As a diabetologist, she has her own diabetes practice (jazindiabetes) in Ljubljana, Slovenia and is also a certified integrative psychotherapist (IIPA). She has been active in the field of psychological aspects of diabetes for more than 20 years and is a pioneer in her country combining diabetes and psychotherapy with psychology. Lately, her focus is mindfulness in diabetes and mindful eating. Medicinskim sestram, edukatorjem, zdravnikom (družinskim, diabetologom, pediatrom in drugim), psihologom, psihoterapevtom, dietetikom, farmacevtom in drugim strokovnjakom, ki delajo z ljudmi s sladkorno boleznijo. V Mestnem muzeju na Gosposki 15 v Ljubljani, 4. april 2019. Kolikšna je kotizacija in kaj vključuje? Kotizacija znaša 50 € in vključuje udeležbo na izkustvenih delavnicah in predavanjih, hrano in pijačo ter materiale z delavnic. Kako se je moč prijaviti? Želimo si, da bi vas DiaMind spremljal čez celo leto. Seveda, če se za to vi sami odločite. Za vas bomo pripravljali DiaMindke, ki vam bodo, upamo, v dnevnem delu koristili. Prijavljam se na osmo mednarodno srečanje DiaMind (Diabetes & Mind), ki bo potekalo 4. aprila 2019 v Ljubljani. Kotizacijo bom poravnal/-a v roku sedmih dni po prejetju računa, ki bo poslan na naslov podan v prijavi.